A new year, new challenges and goals. May I take this opportunity to thank all the lovely people who take time to read and make comments on my Blog, all very much appreciated. My first post for the new year is this lovely lady who I found while searching for inspiration for a Nursery Rhyme swap I am taking part in. She is very different from the usual images you find and I love her. 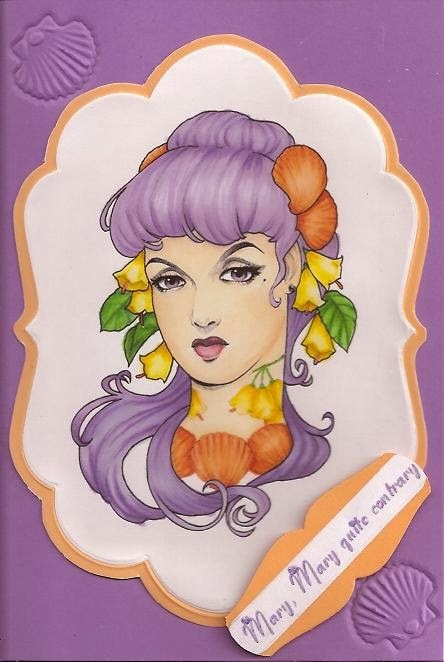 I have coloured her with ProMarkers and used a Marianne Design die cut with a faux die for the main image and then embossed the tiny cockle shell in the corners. You did a wonderful job colouring this image Adie, I particularly like the way you did her hair. Great colour combination as well.